It is the city of Chetumal "The Cradle of the Mexican Mestizaje" because here the first Mexican mestizo was born in recorded history, and the Bay of Chetumal was declared "The Manatee Sanctuary" by presidential decree. Chetumal is located only 12 kilometers from the border with the country of Belize, where you can visit the famous Free Zone by international trade and nightlife of its casinos. 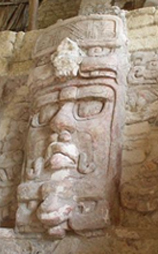 Prehispanic Maya ceremonial centers are located around Chetumal; you will love the highlighted sites such as Kohunlich Oxtankah and the equally impressive Chacchoben Mayan sacred cities, Dzibanché and Kinich-Na. The national track boating at Laguna Milagros and Cenote Azul, with more than 80 meters deep is ranked as the world's largest. 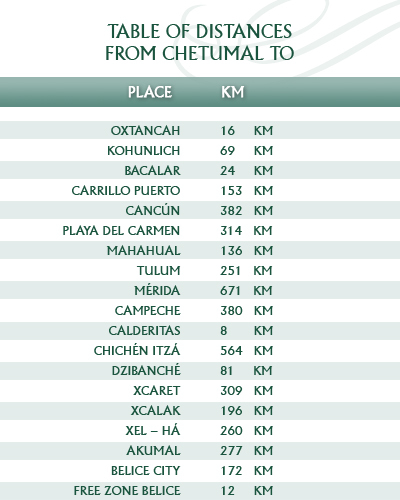 These are 10 and 38 miles from Chetumal, respectively. BACALAR, which has been appointed by the federal authorities of Tourism as one of 35 Magic Towns of Mexico. Because of its beautiful lagoon, internationally famous for its hot seven shades of blue and stories of pirates, the seventeenth-century Spanish fort on the banks of the lagoon, its mystical church built by the indigenous legends and lush emerald is a site not to be missed. The different activities that are practiced in the city of Chetumal are mainly cultural and relaxation, walking down the main street and its surrounding streets to discover some of the old wooden houses "English romantic" aspect Caribbean, visit the Museum of Mayan Culture, enjoy Biouniverzoo ecological park, public buildings such as the Palace of Government of Quintana Roo, the Center for Business and Meetings of Chetumal and the University of Quintana Roo, shopping at the Plaza Las Americas or to walk or exercise along its 14 miles of Boulevard on the banks of the bay. This will ensure you to have a good time. One of the most important festivals held annually here is the International Festival of Caribbean Culture, with highly relevant activities and world famous artists. There are hotels in Chetumal that will help make your stay comfortable and safe, where the Hotel Los Cocos is the best host. Carnival, Fair Coco and Southern Fair Border, are other important festivals celebrated in Chetumal. 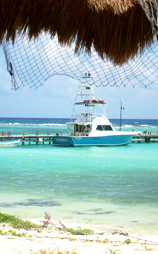 Around the city you can practice ecotourism activities such as camping, swimming and kayaking in the lagoons, jungle treks, cycling practice, photographing the red sunsets of its bay, boat tours along the Rio Hondo or more exciting and extreme sports such as rappelling in the breaker or the Cenote of the Golden Crocodile and if you are a passionate lover of diving, the beach and the sun, Banco Chinchorro, Mahahual and the Costa Maya in southern Mexican Caribbean, with its large coral, turquoise colored waters and white sands, will delight your senses. Some tour operators can take you to visit all these places, but if you decide, the car rental installed in the Hotel Los Cocos, offers clean and comfortable units, so that you can drive from our hotel to the most exciting trips and learn about the Chetumal wonders and Mayan World.